In a comment to John Blase's article Monday, Katy said, "... there's a certain value in a novel ... and that is a window into the author's subconscious ... the reader almost gets to read the author's dreams." That's exactly what fiction is all about -- the (hopefully) vivid imagination of the author beckoning to the reader to take a giant step over the threshold, because as readers of fiction, we aren't, or shouldn't be, observers, but participants. When I open a novel, especially one I'm excited to read (which, sadly, isn't always the case), it becomes a three-dimensional experience. I don't stand at arm's length as with non-fiction. As Steve Grove pointed out, "A novel allows you to enter into an experience like nothing else." Rather, I do indeed step over the threshold into the author's fictional world and become a participant. I quickly develop an affinity with one of the characters, and experience the story as he or she experiences it. And unlike in real life, in fiction there needs to be a lot to experience, particularly in the way of trials and tribulations. 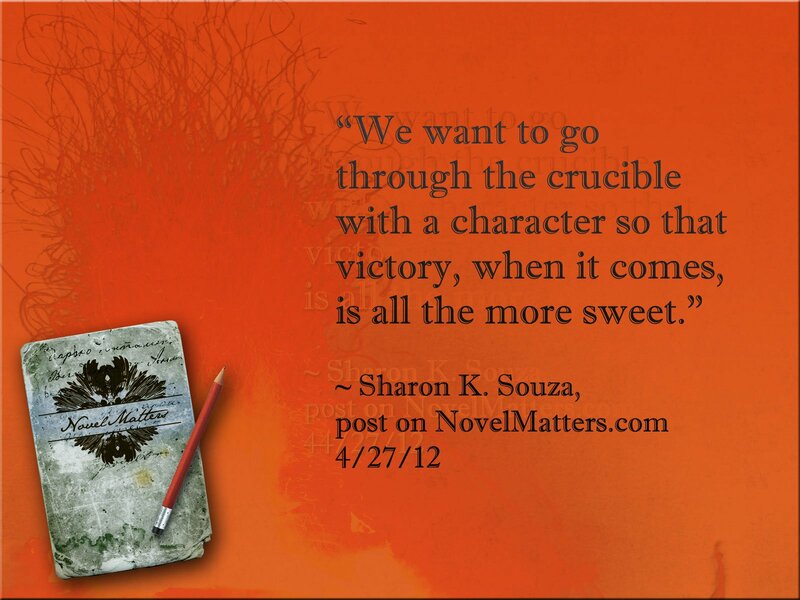 We want to go through the crucible with a character so that victory, when it comes, is all the more sweet. Sol Stein, in Stein on Writing, says, "... because touchy subjects arouse emotion, they are especially useful for the writer who knows that arousing the emotions of his audience is the test of his skill" (pg. 74). So don't be afraid to bring controversy to your story. Controversy is your friend, and it comes in many forms. You're bound to find what's exactly right for your characters and your audience. I've quoted this before but it bears repeating. "Get your protagonist up a tree. Throw rocks at him" (Plot & Structure, pg. 12). Throw every manner of obstacle in your protagonist's path. There should be opposition to your protag's desires and goals in every scene. When the tension is a great as it can be, only then get him down out of the tree. You may say that doesn't sound like much of a dream world. Well, it's not for your characters, but it's perfect for your readers. That's what creates a lasting story. Consider Alice's Adventures in Wonderland. Nothing but trouble at every turn. It doesn't matter that this classic was written as a children's book, it's become a part of our collective consciousness. We still quote from it nearly 150 years after it was written. Who wouldn't love to maintain that kind of influence and staying power? While entering the dream world is entertaining for the reader, it's pure magic for the writer. I'm still amazed that when I allow my thoughts to play make-believe, I find a character waiting to play along. The latest is a 12-year-old girl whose story is unlike any I've attempted so far. But it's not a story I've imposed on her, it's her revealing her story to me, one layer at a time. I love each and every rendezvous that has deepened my knowledge of her until I now feel I know enough to put pen to paper. I don't know it all, not by a longshot, but I know enough to look forward to the discovery of the rest. I recently had a funny conversation with my husband after seeing Dolly Parton interviewed. Perhaps one of the most prolific songwriters of our time, she made the statement that for her, "everything's a song." I said to Rick, "I so relate to what she's saying. I'm not a songwriter, but I have these people living inside me with all these stories to tell, and this one girl has shouldered her way to the forefront, saying, "Me first!" Hers isn't the story I thought I would write next, but I find I must. Does that ever happen to you?" I asked. He looked at me as if I'd grown a third eye. "No," he said, "I can't say it does." And we both had to laugh, because therein lies the difference between a writer and a non-writer. After all our years together he's become accepting of my creative quirks, but he sure doesn't understand them. What about you? What entices you to cross the threshold into the dream world, as a reader and as a writer? Sharon there's so much in this. I realised a little while ago that I'd developed a habit that was both a good one and a bad one at the same time: I'd trained myself so well to "read as a writer", to dissect the structural elements and the nuances of character and dialogue and what worked for me and what didn't, and what I could learn from it for my own work, that I'd forgotten how to let go and cross that magical threshold and read simply as a reader. Now that I've realised it I'm retraining my brain again to slow down and read to enjoy (yay! I've missed this), but there's been something else too that I've learned in the process that relates back to this: there have been just a couple of books that, despite my best intentions to read as a writer, have snagged a piece of my soul on the way in to the point that I was unable to do anything else but fall into the story and laugh and cry and feel along with the characters. Going back and figuring out what caused this has helped me understand the power of good writing so much more. Sounds like a conversation my man and I would have. As I edit, I'm realizing I need to shove my MC further up a tree and find some bigger rocks to toss at her. All this time I've been imposing my will and my thoughts into my characters. No wonder they come across like paper dolls. A lot of the time I'm enticed into story with a simple, dream-like scene or a character whose quirks are so intriguing, whose face is so haunting, that I must follow whomever I meet, wherever I meet them, until I realize what's going on--and then I try my hardest to relay the truth I discovered about that world. Isn't that what we all try to do as writers? Convey the truth about the world we discover? I don't think writin is so much "writing down scenes" as it is discovering a window into another world that only--somehow--we've discovered, and we try our best to tell others the exciting, spine-chilling, ugly truth about what we see. And if we don't, it could be considered a total crime against the people and events we find. I don't know where my next series will take me, but I find myself goose-bumped with anticipation at the people and revery-filled things I've found there. Megan, for writers it's so difficult to read as just a reader. Our subconscious never shuts down, and it does compare and evaluate and look at what does or doesn't work. There's no getting around that. But when you find a book so well written that you "fall into it and laugh and cry and feel along with the characters" it's like FINALLY having that itch scratched that is just out of reach of your own fingers. It's wading through the rubble only to find one precious jewel. And really good fiction is almost that rare. But it's certainly worth looking for. Marian, 3-dimensional characters are vital to good fiction. Understanding that is more than half the battle. Ghosts, you nailed it! We cross that threshold into a world only WE have discovered, and we do our best to tell what we see. I love it.